Parisian silversmiths and jewellers are inextricably linked with the heart of historical Paris, named "Le Marais" (the swamp) (see map). At first the quarter was the shopping center for the royal court and the aristocracy who bought luxurious jewels and silverware. Thanks to the quality of their production, some workshops managed to become appointed purveyor to the king and his court and were rewarded for their talent by prestigious commissions. Later "Le Marais" was abandoned by the aristocracy and the court, whereafter the quarter was invaded by artisans and small industry. During the 19th century the famous goldsmith and jewellery houses boomed, due to the new rich and famous, who could afford to buy luxurious jewellery and silverware. The emergence of these companies however, constrained the smaller shops to close. Indeed, the goldsmith and jewellery shops evolved during their lifetime, encountering growth, moments of fortune as well as financial problems. When the manager of an enterprise retired and voluntary liquidated the company, or after a bankruptcy, competitors took over the firm in difficulty, bought drawings of the patterns, dies, and/or tools and machines, or the complete inventory was sold at public auctions and vanished without leaving traces. At present only a few famous houses are still active in Paris, as there are Odiot, Puiforcat and Lapparra. This study is an attempt to give a clear chronological overview of how silversmith and jewellery houses succeeded each other during the 19th and the 20th century. The flow charts at the end of this article are intended to clarify the intricate succession of manufacturer silversmith and jewellery houses. A short biography of the Parisian houses involved will also give the reader a more complete insight regarding the evolution of their activities. The goldsmith company was founded by M. Boulenger-Hautin in 1810 and named Hautin. 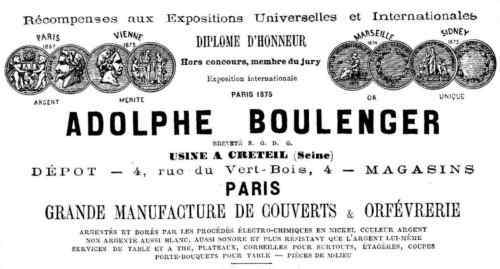 Adolphe Boulenger, nephew of the founder, took over the management of the company in 1864 and gave it the name A.Boulenger & Cie. In 1869 and 1871 Adolphe Boulenger started a metallurgy plant at Créteil, which in 1902 employed 60 craftsmen. At his death in 1898, his son Charles Boulenger took over the business and named it Ch.Boulenger & Cie.
Boulenger was the main supplier of silverware to the French National Marine. The firm was specialised in cutlery, tea and coffee services and tableware, and obtained several prizes at universal and international fairs, for instance Paris 1925, Cairo 1929 and Antwerp 1930. Paul Canaux, a manufacturer jeweller-silversmith, active at 30 rue des Francs-Bourgeois in Paris succeeded the silver-plater Joseph Mégemond and entered his mark on 9 August 1888. 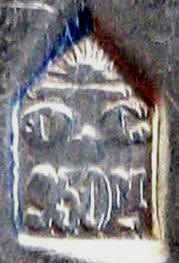 Paul Canaux based his sponsor’s mark (an anvil as symbol) on that of his predecessor Mégemond. He was a manufacturer of silverware, cutlery, tea sets, centerpieces, serving dishes, etc. His maker’s mark was struck off on the 12th of April 1892 and at the same date a new maker’s mark "PC & Cie" was registered, as the house changed its style to Paul Canaux and Company. Paul Canaux & Cie, still manufacturer jeweller-silversmith, now at 30 boulevard Malesherbes, moved around 1889 to 127 rue de Turenne. 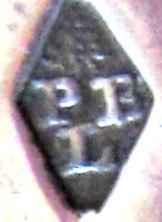 The sponsor’s mark was struck off on the 20th of July 1911. 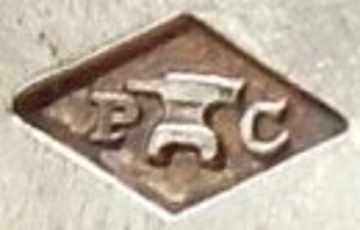 A third sponsor’s mark "an anvil between the letters P and C" was registered by Paul Canaux, manufacturer silversmith at 127 rue de Turenne, the 20th of July 1911 and struck off on 16 December 1930. Maison Murat succeeded to Paul Canaux & Cie. 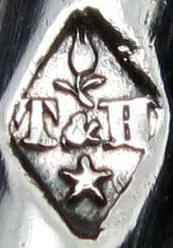 The sponsor’s mark of the silver plater Joseph Mégemond, "J an anvil M", was struck off on the 2nd of August 1888. Joseph Mégemond and Charles Deneux, silver platers, located 3 passage des Petites Ecuries, recorded their rectangular sponsor’s mark "an anvil between the letters MD" on the 2nd of October 1863. The sponsor’s mark was struck off on the 2nd of August 1888. 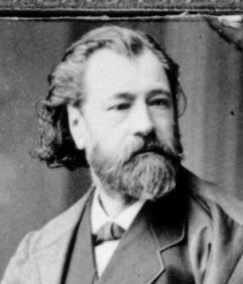 Joseph Mégemond was awarded prizes during the Universal Exhibition of 1878 (silver medal) and golden medals for the 1880 and 1887 exhibitions. A note at the Bureau de Garantie (Assay Office) records that on 2 August 1888 Mister Mégemond presented himself to the Guarantee Office but was not able to show his sponsor’s mark at that time. The French internet site of the Department of Culture (www.culture.gouv.fr/public/mistral/marque_fr) mentions that Paul Canaux succeeded to Mr Mégermond, though several other sources point to Joseph Mégemond (without the letter ‘r’) as his predecessor. François-Alphonse Debain operating from 140 rue du Temple, registered his mark "a rowboat with two little men" on 15 January 1847 and renewed it on 19 July 1851. The mark was struck off on 27 May 1864. His son Alphonse-Edouard Debain succeeded him using the same symbol in his partnership with Louis-Frédéric Flamant, working as Debain & Flamant. 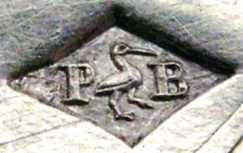 Alphonse-Edouard Debain’s son, Alphonse Debain, became the successor to silversmith Philippe Berthier in 1883 and used Berthier’s symbol "a woodcock" to adapt his own mark to "AD and a woodcock". Alphonse Debain relocated his activities to 79 rue du Temple and Louis-Frédéric Flamant continued the business at 140 rue du Temple. Charles Bertrand Murat, born on 1 April 1818 in Toulon, started his career by creating a factory of gold-plated jewellery. Murat, with his premises at 62 rue des Archives, manufactured chains, bracelets, rings, etc. Murat & Cie, manufacturer jeweller at 62 rue des Archives, registered its sponsor’s mark on the 3rd of July 1884 and the 20th of August 1884. Murat exhibited and received prizes at the Universal Exhibitions of 1855 in Paris, 1862 in London, 1867 in Paris, 1876 in Philadelphia and again in Paris in 1878. Jacques Louis Georges, oldest son of Charles Murat, born 16 December 1851 in Paris, died 24 December 1918 in Paris. Around 1889 he succeeded to his father and registered a maker’s mark "CM and a mulberry with two leaves" on 3 June 1897 at the Guarantee Office of Paris. He continued his career just as his father as an industrial jeweller and politician. By 1900 the Maison Murat, at 62 rue des Archives, was an important business, and a large part of its production consisted in silverware, cutlery and silver tableware, including tumblers, napkin rings, cups for coffee, tea and chocolate, etc. He obtained the Légion d’Honneur during the Universal Exhibition of 1900 in Paris when he was member of the jury. As the couple had no children, his widow Julia Rosselot forwarded the enterprise at her death in 1918, to her nephews. The end of the company is situated at the beginning of the 20th century, when Olier & Caron bought several design drawings of his cutlery models. The maker’s mark of E. Caron was "a rising sun over and a five-pointed star under the letters EC". In 1910 the silversmith E. Caron and G. Olier became associates. Caron became the successor of Henri Soufflot. Caron took over the business of Henri Soufflot, who himself succeeded to Henri Chenaillier. 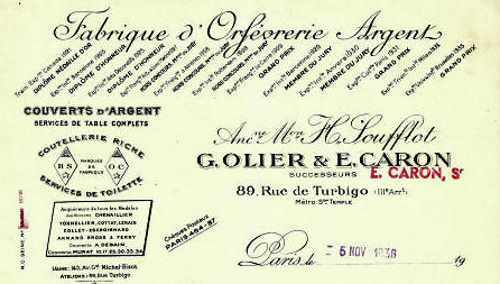 The silversmiths Olier & Caron, active at 39 rue de Turbigo, registered their sponsor’s mark on the 15th of November 1910. The mark was struck off on the 1st of May 1936. 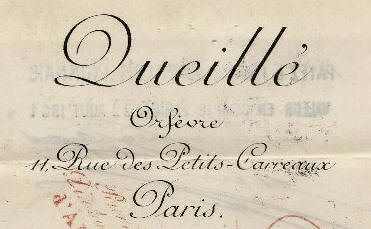 Their documents mention that they were the successors of the house of Henri Soufflot. The name of the house Olier & Caron is as prestigious as the name of Puiforcat. Several distinctions were granted to the house; for example at the French exhibition in 1929 in Cairo, the Colonial exhibition in Paris in 1931 and the Universal exhibition in Brussels in 1935. Note that following document, dated 5 November 1938, mentions that E. Caron is the successor of the house Olier & Caron. The house was founded in 1690 and gained its notoriety with Jean-Baptiste-Gaspard Odiot, who became master in 1720. His grandson Jean-Baptiste-Claude Odiot (born 8 June 1763, died 23 May 1850) became master on 17 December 1785. Following the bankruptcy of the silversmith Henri Auguste in 1809, Jean-Baptiste-Claude Odiot purchased his models, tools and designs and soon replaced Auguste as purveyor to the Emperor Napoleon Bonaparte. Jean Baptiste retired in 1823 passing the business to his son Charles-Nicolas. Charles-Nicolat Odiot (1789-1868) succeeded to his father and became purveyor by appointment to King Louis-Philippe and the Orléans family. His son Jean-Baptiste-Gustave Odiot, active at 72 rue Basse-du-Rempart, registered his mark on 31 October 1865. The mark was struck off on 14 April 1894. Between 1894 and 1906 Gustave Odiot, Emile Prévost and Paul Edouard Récipon were associates and introduced the maker’s mark "PR, an antique lamp, Cie". From 1906 until 1956 the mark "O, an antique lamp, BSr" was in use for the Boulenger company and since 1956 the classic mark “O with an antique lamp” as symbol is again in use. The Odiot family managed the firm during more than two centuries from 1690 until 1906. In 1820 the brothers Emile and Joseph-Marie Puiforcat and their uncle Jean Baptiste Fuchs started off the House at 14 rue Chapon in the Marais quarter of Paris. They adopted the symbol of Fuchs "a desk penknife" for their maker’s mark. The succession was guaranteed in 1902 by Louis Victor Tabouret, who married the daughter of Emile Puiforcat. The house owes most of its renown to Jean Puiforcat (born 5 August 1897, died 20 October 1945), son of Louis Victor Tabouret-Puiforcat. The style of Jean Puiforcat, characterised by pure, architectural lines, is inspired by Art Deco. Around 1927 he moved to Saint-Jean-de-Luz and with the rise of Fascism in Europe he settled in Mexico, where he opened a shop in 1942 and exported his work mostly to the USA. In 1945 he returned to Paris where he died shortly after his arrival. Puiforcat came under the wing of the Hermès group in 1993 but still continues its activity with present-day designers at 48 avenue Gabriel in Paris. Married 28 June 1892 in Paris with Laure Puiforcat (1873-1960), daughter of Emile Puiforcat. In 1902 Louis Victor was associated with his mother-in-law, the widow of Emile Puiforcat. He died in 1955. The fashion house was founded in 1837 by Thierry Hermès. Hermès started as a small workshop in Paris, creating luxury harnesses and bridles for horse-drawn carriages of European noblemen. 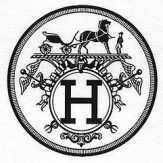 The Hermès logo is a royal carriage with a horse and a coachman. The son of Thierry Hermès, Charles-Émile Hermès, took over the management of the business and installed the shop in 1880 at 24 rue du Faubourg Saint-Honoré, where it still remains today. With the help of his sons Adolphe and Émile-Maurice, Charles-Émile grew the business as far afield as North Africa, Russia, Asia and America. Hermès took over the Puiforcat house in 1993. Henri Soufflot, manufacturer jeweller, operating at 89 rue de Turbigo, registered his sponsor’s mark "a rising sun over and a five pointed star under the letters HS" on the 12th of April 1884. The sponsor’s mark was struck off on the 30th of April 1910. Henri Soufflot manufactured silverware, fine cutlery and silver flatware. The style of the firm changed to Henri Soufflot & Company and continued its activity at 89 rue de Turbigo. The symbol of his maker’s mark was still "a rising sun over a star" in a lozenge. The company took over models of Cottat, Lenain, Collet, Escroignard, Armand Gross and Ferry and cutlery of A. Debain and Murat. The factory was located at 143 rue Michel-Bizot. The sponsor’s mark was struck off on the 9th of November 1910 when Caron took over the business. Silversmith located at 181 rue Saint-Martin who started off before the French revolution and entered his first mark on 26 April 1788. He continued his activity after the revolution and registered his sponsor’s marks "a radiating sun over the letters PBL" in 1798, 1799, 1809 and 1810. Cincinnatis Lorillon, a silversmith-spoonmaker working at 239 rue Saint-Martin and later 3 rue de la Croix-Saint-Martin, succeeded to Pierre-Benoit Lorillon. He entered his maker’s mark "a rising sun over a star" in 1814-15, 17 November 1825, 8 April 1826 and 6 July 1830. The marks were struck off on 7 April 1826, 5 July 1830 and 3 January 1839. Henri-Louis Chenaillier, a silversmith, had his premises at 277 rue Saint-Martin in Paris. 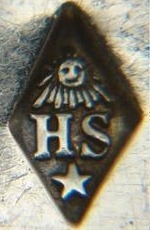 He registered his sponsor’s mark "H and C topped by a rising sun with a star below" the 3rd of January 1839. The mark was struck off at his death on 11 June 1859. He specialized in service sets and larger pieces. The symbol of the mark also represents "a star topped by a rising sun". At the death of her husband, Henri-Louis Chenaillier, his widow continued the business at 56 rue Meslay from 1859 until 1862. She registered her sponsor’s mark on 14 June 1859. The mark was struck off on 17 February 1862. Antoine-Félix Desreux took over the shop at 56 rue Meslay and registered his maker’s mark on 11 March 1862. The mark was struck off on 23 February 1867. Henri Chenaillier, a manufacturer silversmith at 56 rue Meslay, Paris and later at 89 rue de Turbigo in Paris, registered his sponsor’s mark in 1867. The mark was struck off in 1884. Henri Soufflot succeeded him at the same address. Hénin is a real dynasty, which during the subsequent successions and cooperations entered specific sponsor’s marks for each period of its activity. 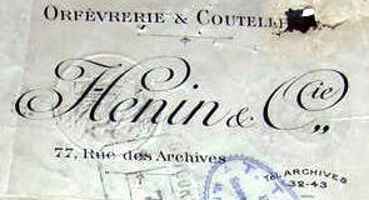 In 1875 Hénin changed the style of the company to Hénin & Cie and continued to operate until 1891. The maker’s mark "a rosebud, the letters HCie and a star" was entered on 11 May 1875. The cooperation of Vivier and Hénin started with the registration on 3 July 1891 of the maker’s mark "a rosebud, the letters HV and a star". The mark was cancelled on 7 August 1896. Starting in 1896 Hénin operated again under the style of Hénin & Company. Around 1974 the House Hénin was managed by Mr Thivans, spouse of Madeleine Hénin, daughter and heiress of Hénin father. Around 1976 his son succeeded him, when the house was faced with severe cash flow problems and fell into bankruptcy. The complete inventory, models, dies, drawings, etc were sold publicly and scattered everywhere. Today several of their models are still manufactured by Odiot. Antoine Lapparra (born 27 April 1857) was the founder of the house in 1893, which at first was located at 3 rue de la Perle, then in 1900 at 157 rue du Temple. 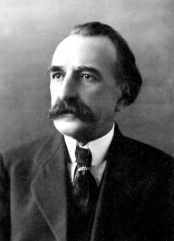 Antoine Lapparra entered his mark "a rat and the initials AL" the 19th April 1895. His predecessor was Eugène Queillé. In 1902, Antoine, in partnership with Georges Gabriel, started the company Lapparra and Gabriel. Their mark "a rat and the initials LG" was entered on 12 August 1902. The mark was cancelled on 26 December 1923 and the company is officially broken up on 28 January 1924. 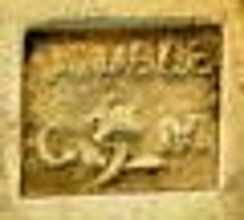 Henri, Antoine’s nephew, succeeded him on 27 December 1923 and entered, at the same date, his mark "a rat and the initials HL". The Lapparra house was overtaken by the brothers Souche on 30 April 1960. The name of the company became Souche-Lapparra, and the mark "a tree stump between the letters SL". In 1998 the name of the company changed again to Lapparra when Olivier Gaube du Gers bought the house. The house Cardeilhac was founded by Antoine-Vital Cardeilhac in 1804 who located the shop at 4 rue du Roule. 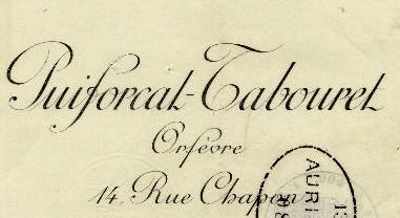 Antoine-Vital registered sponsor’s marks in 1817, 1820 and on 20 June 1829, using the symbol "a crowned cross of the Legion of Honour over a crescent". From 1851 until 1885, his son Armand-Edouard run the company and in 1885 his grandson, Ernest Cardeilhac became head of the company. It was with Ernest Cardeilhac that gold and silversmithing was introduced to the firm. Amélie, widow of Armand-Edouard Cardeilhac, run the company from 1904 till 1913 at 24 place Vendôme for manufacturing of platework and from 1904 till 1920 at 91 rue de Rivoli for silversmithing. Finally in 1920 both sons of Ernest Cardeilhac, Jacques and Pierre, took over the business until 1951, when the company merged with Christofle. Jeweller Charles Christofle (1805-1863) founded the company in 1830 and entered his sponsor’s mark in 1832. In 1842 he bought a license giving him the rights to the electroplating patents of George and Richard Elkington and became silversmith. As from 1851 the Emperor Napoleon III ordered official Empire tableware from Christofle. The titles "Silversmith of the King" and "Purveyor to the Emperor" allowed the company, which became famous, to receive orders from foreign rulers, such as the Emperor of Mexico and the Tsar of Russia. At his death in 1863, his son Paul Christofle (1838-1907) and his nephew Henri Bouilhet (1830-1910) succeeded him. The workshops were at first located in Paris, but later manufacturing of tableware and plated goods was transferred to a plant, built between 1874 and 1876, at Saint-Denis. The activity of this factory ended in 2004 and was relocated to Yainville in Normandy. In 1888 Christofle bought the licence and manufacturing of the firm Alfénide. In 1932 the Christofle company was overtaken by Tony Bouilhet (1897-1984) and in 1968 by his son Albert Bouilhet. Christofle bought Cardeilhac in 1951. Today, the house of Christofle perpetuates its important orders and is also purveyor to the Elysée Palace in Paris. 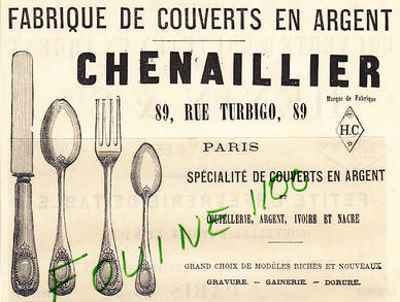 The Queillé family, manufacturers of silver cutlery and tableware during the 19th century, was active for almost a century, during which the company was managed from father to son. The mark "an antique oar between the letters PQ", remained unchanged during the complete lifetime of the company, except for some small differences. The spoonmaker Pierre-François Queillé I registered his sponsor’s mark in 1808 and continued his activity until 1834. Pierre-François Queillé II, a knifemaker, was located at 70 faubourg Montmartre and registered his mark on 23 October 1834. The mark was struck off on 27 November 1846 (ref. N° 03068 des Archives de la Garantie, Paris, registre d’insculpation 1820-1840). The silversmith Eugène Queillé took over the shop and moved to 8 Petite rue Saint-Roch-Poissonnière, where he presented his mark to the guarantee office on 11 February 1847 (ref. N° 01562 des Archives de la Garantie, Paris). In 1874 the Queillé family continued their activity at 11 rue des Petits-Carreaux until 1895, when the shop was overtaken by Antoine Lapparra. François Laslier was a silversmith who manufactured high quality flatware and hollowware. His shop was located at 380 rue Saint-Denis in Paris. He registered his mark on 7 July 1836. The mark was cancelled on 11 February 1848. At the same date he registered the same mark again, which was cancelled on 4 March 1858 when he ceased his business activity. Around that time his firm was bought by Puiforcat who kept some of his flatware patterns for further production. François Laslier was one of the suppliers of tableware to the Odiot company. Philippe Berthier, a prolific silversmith of the second Empire, started his activity at 23 rue aux Ours. Later he moved to 63 passage Beaufort and finally to 21 rue Quincampoix. He entered his first punch "P a garden’s well B" on June 1, 1841; this mark was cancelled on June 28, 1845. He entered a second mark ("P a woodcock B" on June 5, 1847 and a same mark on June 20, 1851. The cancellation dates of these marks are not known but remember that the business of Philippe Berthier was bought by Alphonse Debain, who regained the ‘différent’ "a woodcock" for his own mark. The production of Philippe Berthier consisted mainly of wine tasters, soupe tureens, cups for coffee- tea and chocolate and their saucers, goblets, several types of spoons, such as backstamp seal end spoons, etc.